In 1998 the world reached its peak temperatures, according to Intergovernmental Panel on Climate Change, and ever since its been downhill. The world is going through a Global Cooling period. According to NASA, the snow-ice cover of Antarctica has actually been increasing over the past several decades. It's worth noting that Nashville, the hometown of Nobel Prize winner Al Gore, last year had its lowest temperatures on record since 1877 -- and Manhattan just had its coolest summer since 1958. Does this mean that all the efforts to prevent Global Warming have actually worked? Are carbon emissions down? Not at all -- in fact, carbon emissions are up about 6 percent since 1998. There doesn't appear to be any provable link between carbon emissions and global temperatures. THE sun has gone quiet, with a sharp decline in sunspot numbers in the past couple of years - possibly heralding the start of a solar depression that could lead to cooler weather on Earth. During the past millennium, whenever the sun experienced long periods of low sunspot numbers, Earth had equally long, cold snaps. The number of sunspots - dark and intensely magnetic blotches on the sun’s surface - are at their lowest since 1913. “This is the quietest sun we’ve seen in almost a century,” said NASA solar forecaster David Hathaway. 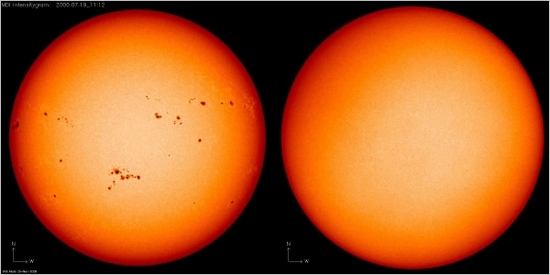 Sunspots cause other solar activity such as solar flares and coronal mass ejections, radiation from which can interfere with Earth’s magnetic field, upper atmosphere and, many scientists believe, Earth’s climate. There have been more than 200 spotless days and scientists expect the count to reach 290 by year’s end. Last year there were 266 spotless days, the previous lowest number recorded since 1913, when there were 311 spotless days. SUN GAZING These photos show sunspots near solar maximum on July 19, 2000, and near solar minimum on March 18, 2009. Some global warming skeptics speculate that the Sun may be on the verge of an extended slumber.